"table" elements are block elements. 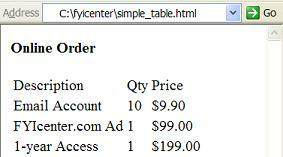 "table" elements can not have empty contents. "table" elements can not have text contents. A "table" element can only have "tr" or other table sub-elements. "tr" elements are used in a "table" element to define rows in a table. "td" elements are used in a "tr" element to define columns in a row.